My love of natural places and their wild inhabitants stretches back to my childhood. Growing up, I spent countless hours wandering the mountains and streams of northwestern North Carolina, occasionally hunting, often fishing, sometimes merely enjoying being in the presence of nature. My interest in and connection with the natural environment was rekindled and strengthened in adulthood when my then five-year old son and I began what evolved into a nearly 20-year backpacking partnership, principally on sections of the Appalachian Trail from Georgia to West Virginia and Maryland, and occasionally on AT sections farther north. I always enjoyed photographing the natural world, though only as a casual shooter for most of my life. Later, inspired by the breathtaking images of pros like Galen Rowell, David Muench, and several less well-known, more regional professionals, I decided to focus more seriously on my photographic efforts and results. I enrolled in classes offered by the New York Institute of Photography to gain proficiency with the technicalities of the craft, as well as the more subjective aspects of artistic composition and photographic design. Like backpacking, nature photography encourages a slower, more observant pace; I find the two interests imminently compatible. Over time, as my son grew into adulthood and increasing responsibilities (and as I aged), photography became the primary focus of my time outdoors. It was only then, later in life, that I began to market the results of my photographic efforts. Though I enjoy photographing in many corners of the US and elsewhere, my work is concentrated on the southern Appalachian Mountains in general and the Blue Ridge region in particular. My photography encompasses both unspoiled—or naturally restored—sections of the southern Appalachians, as well as settings in which human influences, whether historical or present-day, play an important part. Regardless of the geographic area or subject matter involved, however, my photography is driven by two primary goals. 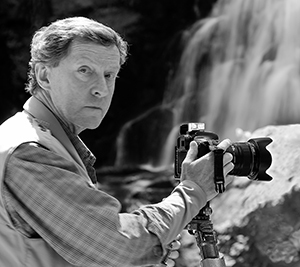 First, I seek to accurately and faithfully record my photographic subjects and—through the resulting images–share what I have seen and experienced with those who view my work. More importantly, I hope to inspire at least some viewers of my images to a greater appreciation of and concern for those relatively few wild or largely unspoiled places that still exist in our nation. I strongly believe that the quality of human existence would be significantly diminished if we had no undeveloped places to experience, no wild and free creatures to observe. As Nancy Newhall put it, “Wilderness holds answers to questions man has not yet learned . . . to ask.” I hope my photographs help encourage preservation and protection of both true wilderness and semi-wild places by providing others the opportunity to view images of nature’s design. Check out D. Rex Miller’s Website, www.drexmillerphotography.com.